BARTON, Clarissa "Clara" Harlowe (1821-1912) was a pioneering nurse who founded the American Red Cross. She was a hospital nurse in the American Civil War, a teacher, and patent clerk. Nursing education was not very formalized at that time and she did not attend nursing school, so she provided self-taught nursing care. Barton is noteworthy for doing humanitarian work at a time when relatively few women worked outside the home. 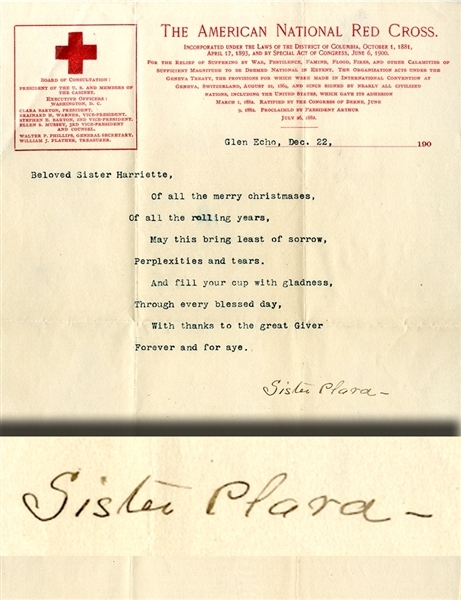 Typed Letter Signed “Sister Clara” 1pp. quarto, December 22, 1900, Glen Echo, being a Christmas greeting on The American National Red Cross letterhead. Fine condition.